It’s a bit of an English tradition to break out the bunting for a happy occasion, so why not make your own in fabric as a keepsake? Here’s how to make jolly fabric bunting with lettering that you can use for a nursery or display on the mantelpiece to celebrate a holiday or changing seasons! 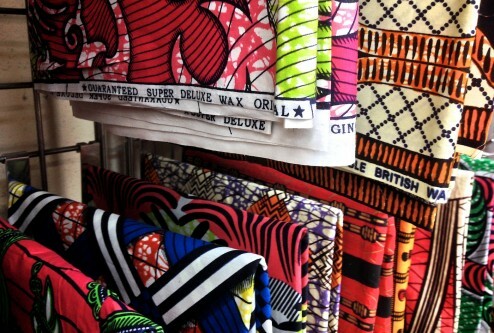 Cotton fabric – pick a few different patterns and colours that you are drawn to! 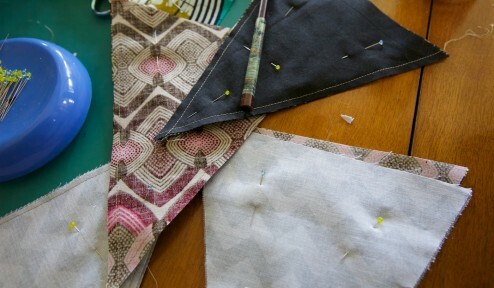 Double width bias binding tape (I used quilting bias but a thinner one will also do) I used 2x 3ft packages. 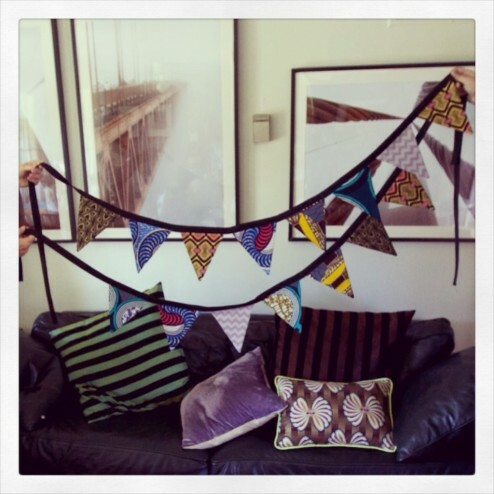 Cut a template based on the size you would like for your bunting. I used 6 x 7 inch triangles. 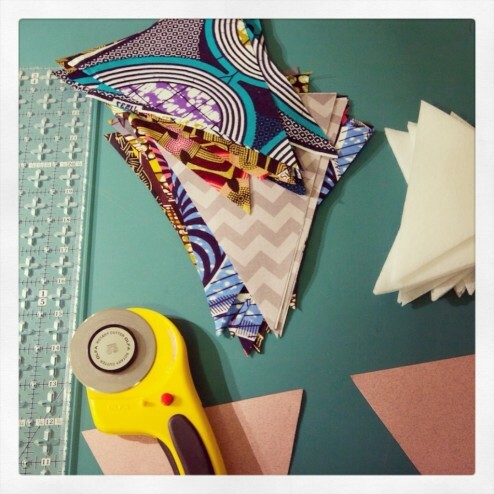 Cut the cotton into triangles with your scissors pinking shears or rotary cutter, add a quarter of an inch all around larger than the template for a margin. Cut batting into triangles half an inch smaller than your template all the way around. 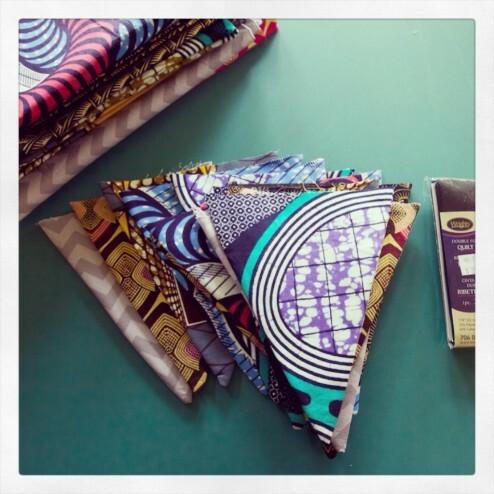 Choose two triangles of fabric, you can use the same fabric or mix it up. Pin two triangles back to back wrong side out. Sew the two sides together on the quarter inch margin, leave the short side open. Add a triangle of batting and iron it on. Push the triangle the right way round, use something to poke the pointy end to a point, I found a chopstick was good for this. Iron the pennants so they are nice and flat. 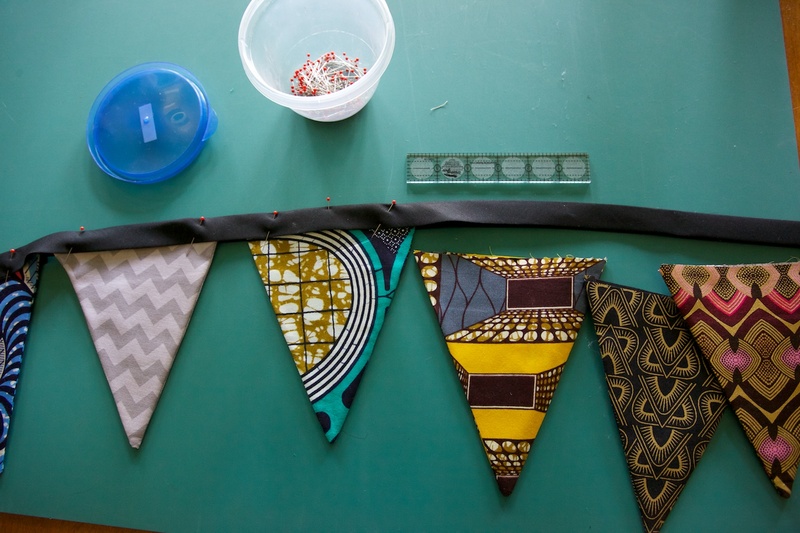 Arrange your triangle pennants in the order you would like them to appear on the bunting and tuck the top part inside the bias tape. 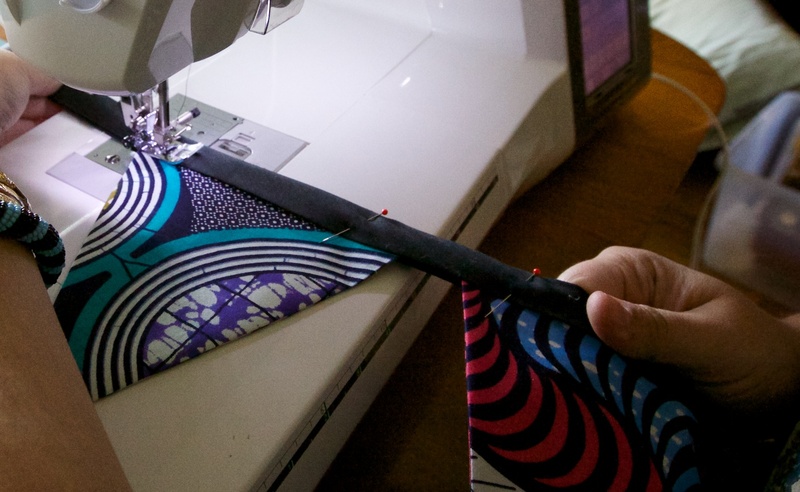 Pin them in position, placing them 1 inch apart. 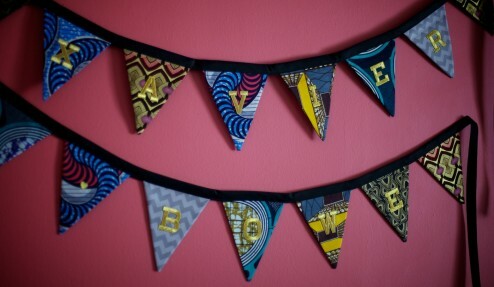 Make sure you leave equal amounts of tape at each end of the banner for hanging. 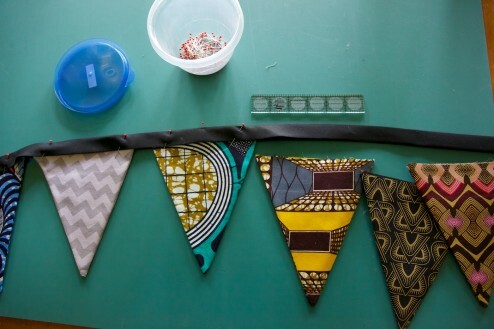 Take the bias tape and sew the the tape together all along its length close to the edges until you get to the pennants, then carefully removing the pins as you go, continue to sew along the edge of the tape, to secure the pennants in place. Voilà! your bunting is complete! It looks really fun to add lettering, perhaps a baby’s name or a phrase, (congratulations?, happy birthday?) or something to welcome a season or a holiday. 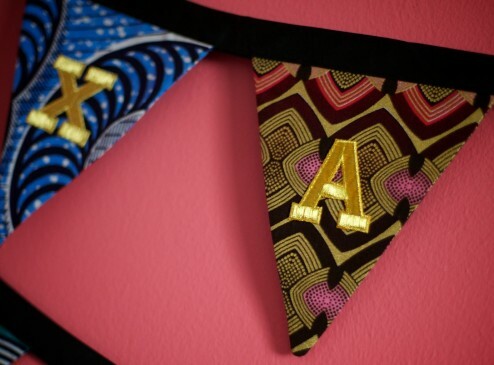 You can buy letters from Michaels, Hobby Lobby or Jo-Ann craft shops in the US, or online – I ordered 2 inch letters from Laughing Lizards, I like them because they have a masculine letterman feel but still shiny and fun, and were easy to iron in place. 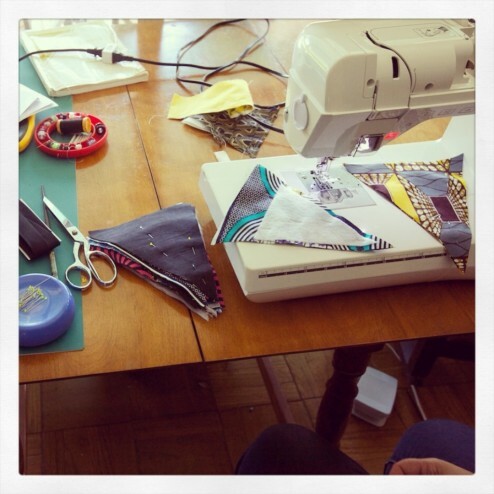 You could also consider hand embroidering lettering or perhaps your sewing machine has an embroidery feature? Another way to add lettering is to hand or machine appliqué some fabric or add iron-on fusible web to cotton or felt. T-shirt transfer paper is also worth a try, cutting the letters out from a template you can create on your computer from any typeface that you like. For my nursery bunting, I chose not to go with pastel shades and instead selected some African fabric from Ashanti Fabrics in the LA Fashion District and threw in some chevron patterned cotton from Michael Levine. I love how these Dutch wax cottons look so fun clashing together, and the rest of the room has a brightly coloured African-influenced theme.